Nokia 3, one of the three latest smartPhones from HMD Global, which was launched recently in India, is now available online in the Country. The phone was originally a "retail store exclusive", meaning you could only get it from local stores. 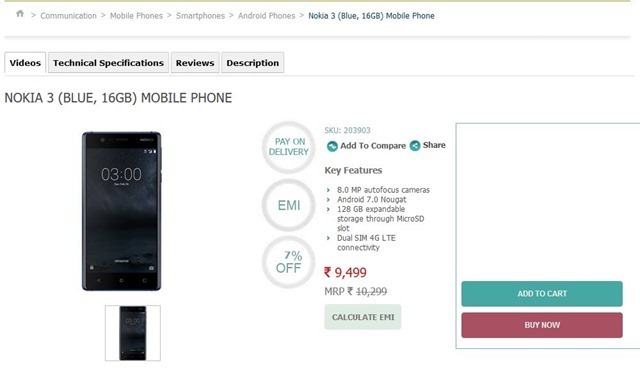 But, now the Nokia 3 has been listed on Croma's website. The e-Store listing's price is the same, at Rs. 9,499. 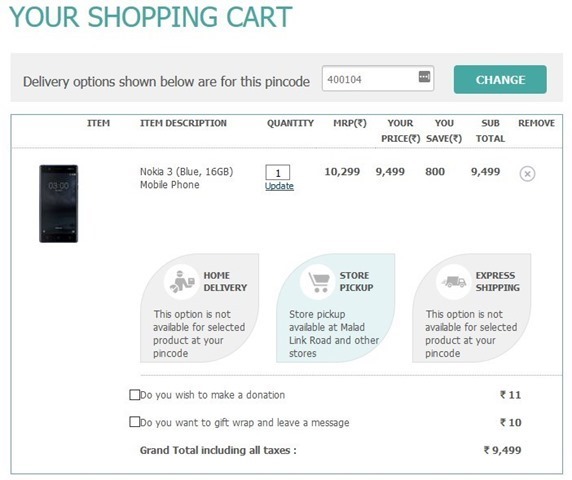 We did check if the device could be added to the cart, and it does work. Oddly though, there is no home delivery option for the pin codes we selected, but there is a store pick up option, which you can choose by ordering it online. This is better than going to the store and returning home disappointed, if the device is not available I suppose. We suggest thinking twice before making your decision, as the price of the Nokia 3 is a tad on the higher side, compared to the technical specifications it has, i.e. the MediaTek 6737 chipset, 2650 mAh battery, and no fingerprint sensor. Clearly, the device doesn't have the best specs for its budget range, so you could go for a slightly better one like the Moto G5 for some extra money, or a similar device to the Nokia 3, for a few thousand bucks lower, like the Redmi 4X. Nokia 3 now available online in India, but there is no home delivery option yet.